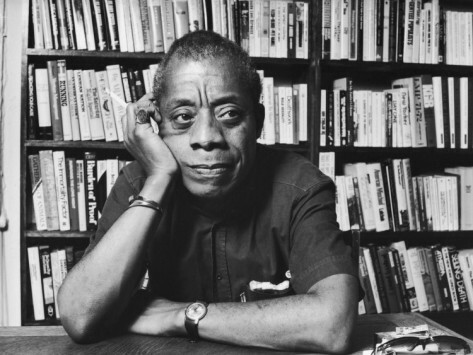 A brief biography of James Baldwin, writer and social critic. James Baldwin from Life Magazine. 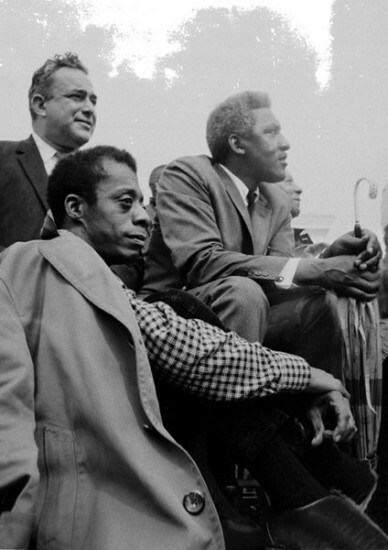 James Baldwin, Bayard Rustin, and (to Rustin’s right) A. Philip Randolph at the Selma to Montgomery March held March 24-26, 1965. Used with permission of © Stephen Somerstein. James Baldwin (Aug. 2, 1924  Dec. 1, 1987) was a novelist, essayist, playwright, poet, and social critic. Born in Harlem, Baldwin was a “witness to the truth” about racism and homophobia through his novels, plays, essays, and poetry including Go Tell It on the Mountain (1953), Notes of a Native Son (1955), Giovanni’s Room (1956), Nobody Knows My Name (1961), Another Country (1962), The Fire Next Time (1963), If Beale Street Could Talk (1974), and The Evidence of Things Not Seen (1985). We share here two of Baldwin’s essays that make for rich discussion about K-12 education today. “Since I am talking to schoolteachers and I am not a teacher myself, and in some ways am fairly easily intimidated, I beg you to let me leave that and go back to what I think to be the entire purpose of education in the first place. It would seem to me that when a child is born, if I’m the child’s parent, it is my obligation and my high duty to civilize that child. Man is a social animal. He cannot exist without a society. A society, in turn, depends on certain things which everyone within that society takes for granted. Now the crucial paradox which confronts us here is that the whole process of education occurs within a social framework and is designed to perpetuate the aims of society. Thus, for example, the boys and girls who were born during the era of the Third Reich, when educated to the purposes of the Third Reich, became barbarians. “The paradox of education is precisely this—that as one begins to become conscious one begins to examine the society in which he is being educated. The purpose of education, finally, is to create in a person the ability to look at the world for himself, to make his own decisions, to say to himself this is black or this is white, to decide for himself whether there is a God in heaven or not. To ask questions of the universe, and then learn to live with those questions, is the way he achieves his own identity. But no society is really anxious to have that kind of person around. What societies really, ideally, want is a citizenry which will simply obey the rules of society. If a society succeeds in this, that society is about to perish. The obligation of anyone who thinks of himself as responsible is to examine society and try to change it and to fight it—at no matter what risk. This is the only hope society has. This is the only way societies change.” Continue reading. “. . . I know what the world has done to my brother and how narrowly he has survived it and I know, which is much worse, and this is the crime of which I accuse my country and my countrymen and for which neither I nor time nor history will ever forgive them, that they have destroyed and are destroying hundreds of thousands of lives and do not know it and do not want to know it. One can be—indeed, one must strive to become—tough and philosophical concerning destruction and death, for this is what most of mankind has been best at since we have heard of war; remember, I said most of mankind, but it is not permissible that the authors of devastation should also be innocent. It is the innocence which constitutes the crime.” Continue reading in The Progressive, December, 1962. This reading is not on the approved reading list…how about that for prohibiting critical thinking.